Reviewer's Note: Last year, I wrote an extensive review of Shout! 's first Kovacs collection, so I'll port over a few bits and pieces from that article for background, with additional thoughts added covering this new release. A worthy follow-up to last year's spectacular Kovacs release...so let's keep 'em coming, Josh! Shout! Factory, the most important releasing company out there for vintage television fare, has released The Ernie Kovacs Collection: Volume 2, a three-disc collection that includes eight more episodes from his live 1956 NBC morning show (with additional stand-alone bonus sketches from that series), three more episodes of his delightful ABC game show Take a Good Look, plus some really cool, rare bonuses from Edie Adams' vault (including the pilot episode for Ernie's proposed sitcom, Medicine Man), along with a helpful episode guide, chock-full of Kovacs info from historian Ben Model. A must-have for anyone interested in the evolution of television comedy, from the medium's first true genius. As I wrote in my first review, as a small boy, I knew Kovacs primarily from his various movie roles; his television work (what remained of it) had long since disappeared from the day-to-day TV dials. 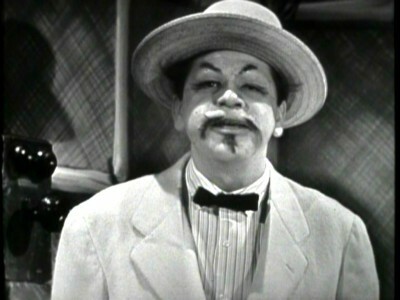 With films like North to Alaska, Bell, Book and Candle, Wake Me When It's Over, and particularly Operation Mad Ball in regular TV syndication, Kovacs, with that distinctively rubbery punim and matching mustache and eyebrows, was a familiar presence on afternoon and late, late show movie programming. Fortunately, in 1977, my father alerted me to a PBS series that showed clips of Kovacs' television work, and it was immediately apparent to this 11-year-old television addict that Kovacs was much, much more than a visibly bored foil to the Duke. Watching Shout! 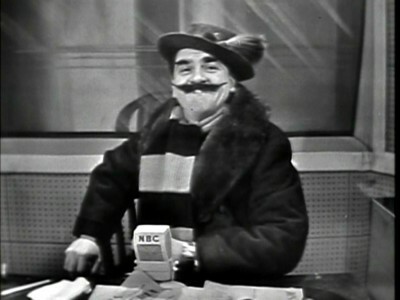 Factory's The Ernie Kovacs Collection: Volume 2, all of those feelings of first discovery for Kovacs' comedic and technological genius came flooding back―with the benefit of seeing hours and hours of previously unreleased material to deepen that appreciation. Let's look very briefly at each disc's offerings. 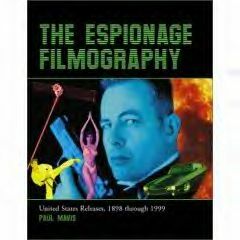 As I wrote in my previous review, I know for many admirers and scholars of Kovacs, his later work in television―particularly the monthly specials he did for ABC in his last years―are considered his most important, at least from the standpoint of establishing Kovacs as a genuine artist whose innovation and mastery of television technology established the bar for all those who followed (I crack up when I read blog comments praising pale, pale Kovacs imitators like Conan and Letterman as "innovators" in live television comedy). 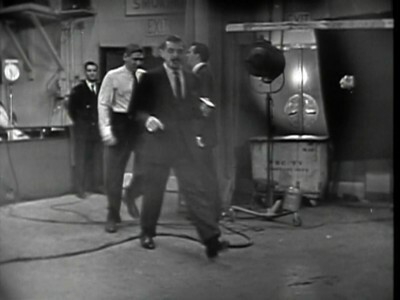 However, those earliest days of live television still hold the greatest fascination for me (not surprising when so much of what is left of television "history" is canned, filmed material); seeing a gleeful Kovacs' early forays into live TV generate the largest laughs for me. Of course, it's mesmerizing (and funny) to watch Kovacs in his later "Eugene" character, making his way through a surrealistic television universe where the laws of physics don't apply. But those last forays into auteurist comedy are rigidly controlled by the meticulous Kovacs; they're as much expressions of iron will as inspired comedy. 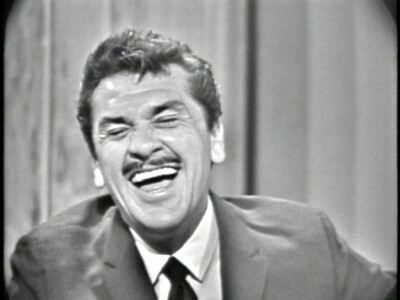 The "early" Kovacs, though, is fast and loose and ad-libbing like a fiend, laughing with his rowdy off-camera crew, and reacting with a measure of searching puzzlement when he encounters laughter from his lagging-behind live audience. 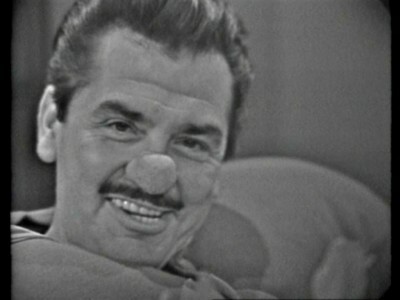 That's the early television, the "early" Kovacs, that brings that ephemeral period of "anything can happen" television history alive to me―and the one that makes me laugh the hardest. 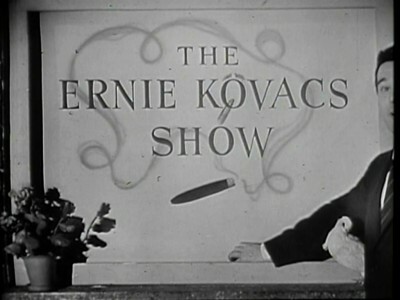 Disc one concentrates on four episodes of Kovacs' The Ernie Kovacs Show, which aired mornings on NBC from December 12, 1955, to July 27, 1956 (with 75 episodes preserved on kinescope by wife Edie Adams, this show represents the largest cache of early live Kovacs material). According to what I've read about Kovacs, he wasn't happiest working in front of a live audience...but you wouldn't know it from the laughs and genial good humor he shows towards the people trying to keep up out there in the cramped Studio 6B audience. I'm not sure I buy the accepted theory that states general audiences didn't like Kovacs; if that were truly the case, he wouldn't have continued to be signed to work in television and movies with increasing regularity (and higher budgets) until his death. I often think that theory comes from historians and other performers who want to make Kovacs "exclusive" to themselves and to people like themselves who "get" a guy like Kovacs...while stating the "mob" out there didn't (you can see all sorts of clips of Kovacs noting the thousands of appreciative letters he gets from that "uncomprehending mob"). That view enhances the "misunderstood, under-appreciated genius" take on Kovacs that's such a popular, faux-romantic construct for artists and their historians (you only need watch some of the commentary on the American Cinematheque panel discussion included on this set's third disc, to understand what I'm getting at). In these four episodes from January 6th, 23rd, 30th 1956, and March 16th, 1956, Kovacs is flying, throwing off ad-libs with abandon as he tries to execute his increasingly imaginative gags. And if they bomb, or flub technically, he laughs and moves on without a care. In today's television, where even the most innocuous local Sunday morning public service program is homogenized and produced down to somnambulance, the looseness of these early network shows are breathtaking; TV will never be that innocent and fun and dangerous again. 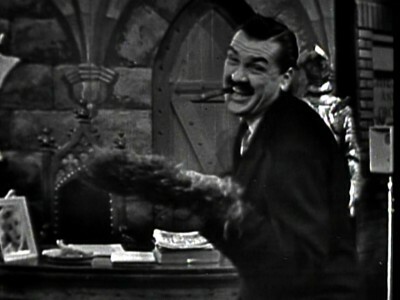 Sitting in his faux-dungeon set, complete with animated knight's armor behind him (watch Kovacs playfully try and trick his sound man by lifting the face mask, waiting for the late, incongruous sound effect that inevitably follows), Kovacs waggles his cigar and squints out into the lights, constantly checking the time and cursing the lack of it because he can't fit in another gag he has prepared. This is television at its most elemental and primitive, and it's exciting as hell. 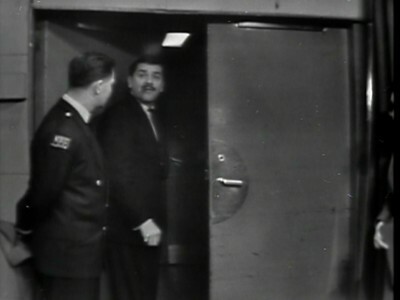 Highlights from the January 6th episode include one of my all-time favorite Kovacs moments: he busts through the studio door just as they go on the air, calling back behind him, "Don't anybody touch the cards...I'll be back in half an hour!" A classic moment from the inveterate gambler. The gorgeous, talented Edie Adams shines here, singing Look For the Silver Lining...while baking a cake (Kovacs states he wants to do routine TV stuff differently), before she kills in The Zaza Estherhazy Show as an oblivious, glamorous TV interviewer (Kovacs again showing his prescient spoofing of early TV's conventions). The January 23rd episode has an edgy, hilarious moment from Ernie when he's "forced" to read a promo for one of NBC's Head of Programming Pat Weaver's upcoming "super specials." Kovacs mumbles through the promo before he gets to the copy that states he'll be watching, too...which clearly ticks him off. He threatens to watch something else, before he looks up and calls, "Right, Pat?" going on, "He runs the network with another chap named [General Robert] Sarnoff―both good boys. Ya got a good job there! Don't louse it up! One slip and you're out! Both of you!" Beautiful. "Chermam disk chockey" Wolfgang von Sauerbraten shows up to say "Guten Tag" to "ze hep katzen und squares," before he plugs his sponsor: chocolate-covered sauerkraut ("Der kiddies luff it!"). January 30th's show has Ernie helpfully telling the TV audience what the show's line-up is "so now that you know what's on today, you can tune to another station." Kovacs' spoof on early TV puppet shows, The Kapusta Kid in Outer Space (Polish sausage and cabbage) returns, with the Kapusta Kid hilariously flipping out at the end of the skit, sick and tired of his daily TV grind (is this Kovacs talking here???). And in Ernie's spoof of daytime soaps, The Troubled Lives of Bessie and Albert, Kovacs or one of his writers (Mike Marmer, Rex Lardner or Deke Hayward) come up with what might be my favorite joke of the set: listing the various troubles of each of the characters, little 2-month old Melanie "has a blinding headache trying to read the patent number on her rattle." Jokes don't come funnier than that. 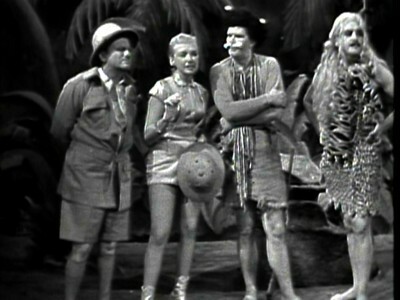 Finally, March 16th's episode has Ernie prepping his audience for the upcoming Leena, Queen of the Jungle skit ("We are going to stretch everything else in the hopes of not getting to it,"), before Edie sings (beautifully) Tura Lura Lura (watch Ernie so pleased at how prettily she sang it). The episode ends with Ernie going out into the audience, with this classic taunt from the naughty Ernie to a shy viewer: "Hey! You look like you're trying to avoid me―I'll talk to you!" 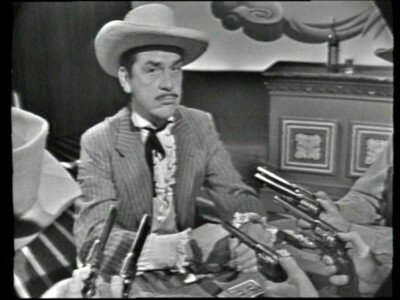 For the January 26th, 1956 episode, Ernie comes this close to saying outright that secretly-closeted Rock Hudson is gay when Kovacs executes a flawless parody of those extended 50's movie trailers: this time, it's Rock Mississippi in The Umbrella Salesman of Ranchipur. One picture of Ernie as Rock is enough description for what he was shooting for here (I particularly liked the flogging of Hollywood innovations to get TV viewers into the movie theaters: "In Schizophrenic Sound! It comes from under your seat!"). The Hollywood theme continues with a visit from high-pitched celebrity whiner Skodney Silsky, who executes an absolutely filthy joke that the rowdy studio crowd immediately gets ("Hollywood! Where many an aging actress is on her last lap! "), before he runs down a hilarious, bizarre scenario for an upcoming movie, Son of I'll Cry Tomorrow, which has Kirk Douglas scuba diving through an emergency room, and "Sabu riding on a guinea pig being checked for German measles." The April 17th episode unfortunately clearly shows one of those musical edits that Shout! warns the viewer about (prohibitively expensive music clearances) when Edie should sing a song with a puppy (perhaps How Much is That Doggie in the Window?). Ernie goes out into the audience, warning the people at home not to let the kids get too close to the TV: he's got a cold, before he offers a visitor a choice between either a Mozart or Eddie Fisher album (when the woman chooses Mozart, Ernie looks into the camera and says, "Boy, if Mozart 's watching, he's gonna be burned!"). 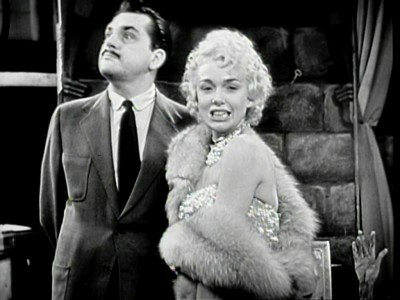 May 17th's episode has a wickedly funny parody of Marilyn Monroe (back before all of today's phony veneration of the icon's reputation―back when she was rightly thought of as a pretentious dope), during her culture vulture New York phase. Here, Edie (devastating as Monroe) recites a poem, Night ("All hail the stripped racoon at large from whom we get much fleas. "), before she bumps and grinds off camera (watch a clearly impressed Ernie yelling, "Come back here!" as he chases her wiggling form). Poet laureate Percy Dovetonsils shows up (the staff slips the standard goldfish into his martini), before the show ends with the kids in the audience screaming for Ernie to stay when they run out of time. Finally, the June 27th episode has a funny bit with Kenneth Mockridge, Philosophical Taxi Driver, who picks up a chef with an elaborate cake...before abusing him as Kenneth picks up his brother and some broads for a little in-taxi party ("Get out, ya crumb! Ya fat creep!" he yells to the chef when the cake is smashed). 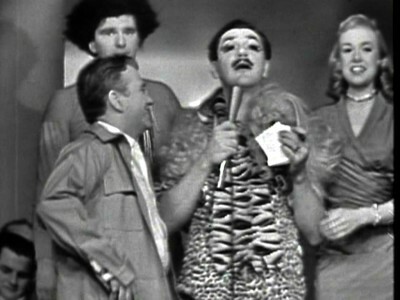 One of the true delights I discovered in the first Kovacs set was Ernie's ABC game show, Take a Good Look, a screwy faux-panel show that was nothing more than a showcase for Kovacs ad-libbing with his guests inbetween some delightfully filmed "clues" that are marvels of comedic timing and invention. 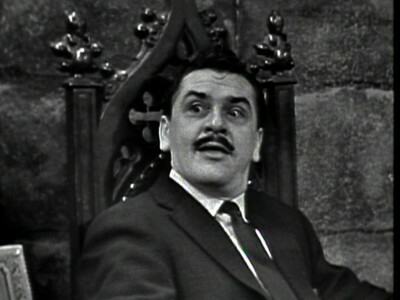 Disc three of the The Ernie Kovacs Collection: Volume 2 features three of these episodes. Take a Good Look ran for two years on ABC (1959-1961), airing on Thursdays at 10:30pm, right after The Untouchables. Apparently, Ernie was amenable to taking this game show to help pay off his crushing debts to the government due to his chronic hatred for paying unfair, exorbitant taxes (bless you, Kovacs). As such, this gig has been lumped in by some historians with other questionable Kovacs film roles and TV guest spots, described as less-than-desirable projects done strictly "for the money." 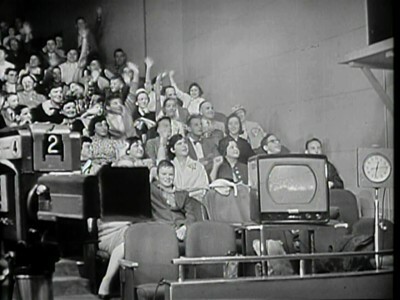 However, I find these Take a Good Look shows absolutely hilarious, not only for the devilishly obscure "clues" that Kovacs filmed for his guests (much like What's My Line?, the panel had to guess who someone was; here, they were given film clips shot by Kovacs to lead them along), all of them beautifully obtuse and indecipherable, but also for Kovacs' complete disregard for the game itself. The panel, unless they already know the guest, never get anywhere near guessing who the person is, as Kovacs has their timer bells ringing in faster and faster until the whole enterprise is finally taken for what it is: an elaborate spoof of the panel shows on the air at that time. It's terrific to see Kovacs so loose and informal with his guests and panel, laughing and ad-libbing without a care since his "clue" spots are already in the can. 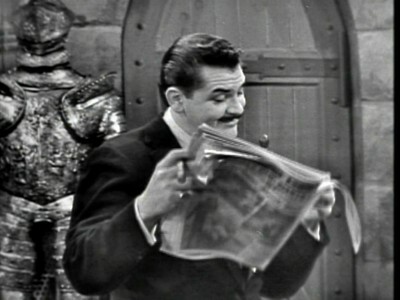 In the April 21st, 1960 episode, Edie can be heard whispering to a too-serious Tony Randall, "He's naughty...you'll get used to him," when Ernie tops Tony in traded put-downs. The filmed clues are, as usual, hilarious (check out Ernie dressed as a baby―complete with cigar and mustache―carried off by an eagle). April 28th's episode has Ernie offering this to the confused viewers at home: "And now I shall explain the game to you...perhaps some other time." The Dutch Masters cigar commercial featured here is one of Ernie's best (the beautifully executed camera work, quite rightly, is singled out by Kovacs when the commercial ends). 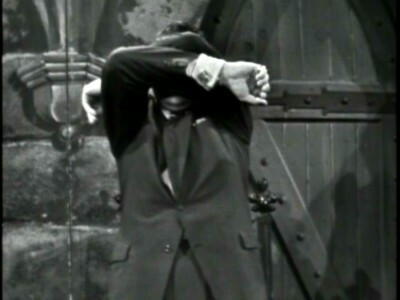 Finally, the March 2nd episode has hooded Carl Reiner killing Ernie with his female voice, before a Superclod spoof clue offers one of the set's best jokes: "You're so pusillanimous!" Lois Lane says to lame Clark, who responds, "You could always open a window." Screams. 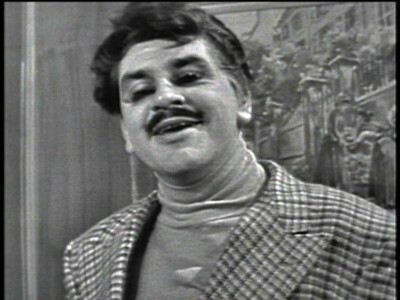 Next up is an interview Kovacs conducted in 1961with the CBC's Lively Arts series, where we learn not only is Ernie putting his own money into the ABC specials when they go over budget (a very unusual step for a TV star back then, and a good indication of what these specials meant to Ernie as an artist), but that ABC was gently pushing him to be on-screen more often, which he resisted (another good indication that that whole "the general public didn't 'get' Ernie" theory is hogwash). It runs 20:18. Next, A Pony For Chris, the unaired 1962 pilot for Ernie's filmed sitcom, Medicine Man is included. In his terrific episode guide, Ben Model seems cool to this "canned laughter" sitcom, but I found it quite clever and amusing, with plenty of recognizable "Kovacs" moments despite it not being an experimental labor of love like his ABC specials (I love Ernie pushing the kid out the window, adding as an afterthought, "Don't forget to hang onto the rope."). One can only imagine what might have come from this teaming of Kovacs and silent film legend Buster Keaton if this sitcom had been produced (Ernie would have his fatal car accident right after the pilot was shot). Next, a panel discussion at the American Cinematheque in Hollywood is included; it runs 39:44. Next, some wordless color home movies showing Edie and Jackie Gleason, among others, playing golf, is included; it runs 5:41. Finally, two trailers for later Kovacs movies, Five Golden Hours and Wake Me When It's Over, are included (very poor original elements used here). The full-screen, 1.33:1 black and white kinescope transfers for The Ernie Kovacs Collection: Volume 2 look about as good as one would expect, considering the rarity of the original materials. Not nearly as bad as the third and fourth-generation knock-offs you see in public domain titles, but also not quite as good as some of those "boosted" kinescopes I've seen, such as the restored Elvis kines from The Ed Sullivan Show, these transfers are in the upper range, with sharpish pictures, solid blacks, and little video noise. It should be noted here, that Shout! is up front on the second disc that musical numbers have been edited out for clearance purposes. If you're a "baby with the bath water" type, you'll find this troublesome. If you're the type who'll take the best that you can get, you'll be okay with this necessary compromise. The Dolby Digital English mono audio tracks are acceptable, as well, with all dialog cleanly heard. Fluctuations in recording levels are from the original materials, not the transfers. No subtitles or close-captions, though. On discs one and two, isolated skits from Ernie's NBC morning show are included. 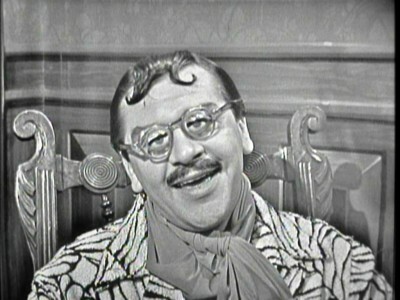 On disc one, bonus skits include: Interview: Algernon Gerard, Archaeologist; his popular recurring Howard, the World's Strongest Ant: A Hot Date ("Little fella didn't make out too well," Ernie offers); Strangely Belive It: Writers to Blame (Ernie gets a bigger laugh by bringing out his writers to take the blame for a half-assed, last-minute show opener); The Kapusta Kid in Outer Space Meets Olivia Scilloscope (a nice precursor of Ernie's experimentation with video's possibilities); Charlie Clod in Brazil (not sure what's funnier: Charlie's advice, "Not possible for stiff to drink oneself, but possible to drink oneself stiff," or Ernie, in character, commenting on his new performer walking off camera when he's supposed to be dead, "He learn,"); Ernie's Opening Monologue; Percy Dovetonsils: "Ode to Electricity" ("Drink it yourself, you old silly! I can be made sport of for only so long!" Percy fumes when the crew mess with his martini); and Interview: The World at Your Doorstep (Edie again wows the men in the audience as the stupid "Miss Soil Erosion of 1955"). On disc two, skits include Irving Wong: Tin Pan Alley Songwriter; Percy Dovetonsils: "Ode to a Housefly" ("I could smash every one of you...with my purse," Percy steams when the audience doesn't laugh at his joke); Introducing Coloratura Mimi Cosnowski (Edie again shows what a funny performer she was); Howard, the World's Strongest Ant: Howard's Campground; Skodney Silsky, Hollywood Reporter; Ernie's Opening Monologue; Surprise Audience Member (legendary Al Kelly kills as a double talking art dealer who doesn't know who the Great Masters are); Audio Lost; and Matzoh Hepplewhite (where Ernie looks genuinely...perturbed that the crew doesn't have his gags ready). More early live television gems from the medium's first true genius. Shout! 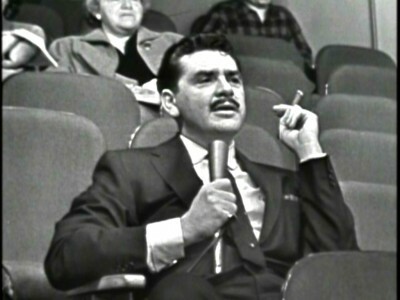 's The Ernie Kovacs Collection: Volume 2 keeps the long-lost Kovacs material coming in this hilarious collection of episodes from Ernie's 1956 NBC morning show and his 1960 ABC game show. Come to think of it, to write this is necessary viewing for anyone interested in the evolution of American comedy on television, is too obvious...and too limited. 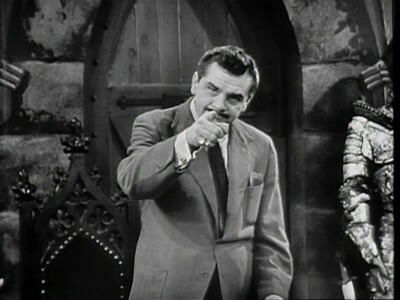 I'm giving The Ernie Kovacs Collection: Volume 2 our highest ranking here at DVDTalk: the DVD Talk Collector Series award.